One of the biggest signings of the summer was Tigres’ acquisition of Enner Valencia. Valencia has an outstanding record of 20 goals in 38 Ecuador games, and was deadly in front of goal during his previous spell in Mexico. In 2014, Enner scored 18 in 23 Pachuca games, as Los Tuzos reached the Liga MX final. 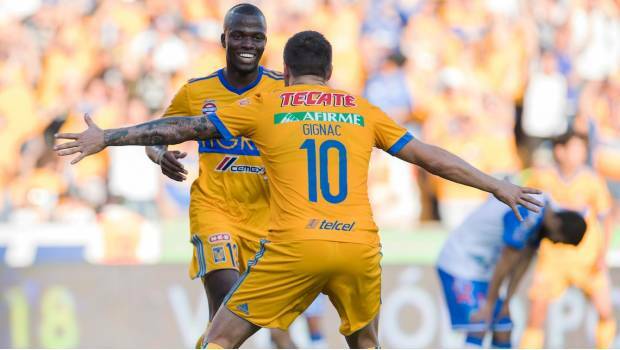 Back from a disappointing spell in England, Valencia announced his Liga MX return in spectacular fashion, scoring a hat-trick as Tigres thrashed Puebla five-nil. 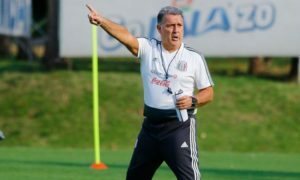 With the arrival of Valencia, and departure of Guido Pizarro, many speculated that Ricardo “Tuca” Ferretti would switch to three-at-the-back in order to fit in all of his star forwards. On Saturday, we saw a 3-4-3 system from Tigres. This formation change meant that Tuca was able to field André-Pierre Gignac, Eduardo Vargas and Enner Valencia in a frightening front three. The front three were distributed in an inverted pyramid. Gignac and Valencia were used as wide strikers, often playing in the half-spaces in-between Puebla’s full-back and centre-back. Vargas mostly played between Puebla’s defensive and midfield lines. This positioning, and the movement of the three attackers, helped Tigres to tear Puebla apart, with La Franja’s defenders struggling to pick “VVG” all game. Valencia displayed his clinical finishing, and grabbed a hat-trick. There are question marks over whether or not this tactic will be solid enough defensively. But the five-nil victory suggests there’s plenty of potential, particularly with VVG in attack. Miguel “Piojo” Herrera has endured a difficult start to life back at Estadio Azteca, with consecutive defeats to Querétaro. The first loss, in the súpercopa, wasn’t of too much concern, but losing at home in their Liga MX opener was a very poor result for América and Herrera. When everyone’s fit, Club América have a superb team on paper. However, depth is an issue. The absence of Guido Rodríguez, Cecilio Domínguez and Renato Ibarra hit Las Águilas hard. América played with a sluggish tempo in a laboured performance, without much of a spark in attack. 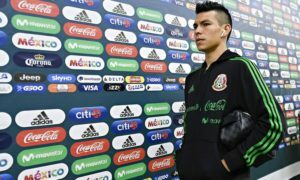 Oribe Peralta and Silvio Romero didn’t work as a partnership, as has been the case on many other occasions, whilst Carlos Darwin Quintero looked a shadow of his former self, yet again. América looked like they’d at least earn a point, but Piojo’s men over-committed late in the game. Querétaro exploited a four on three counter-attack, winning a penalty when Édgar Benítez was fouled by Bruno Valdez. Camilo Sanvezzo dispatched the spot-kick, confining América to an opening jornada defeat. With their current lack of depth, it seems that América and Piojo need their key players back to fitness, or a re-enforcement or two, if they are to live up to expectations this season. Eduardo Coudet’s time in charge of Tijuana couldn’t have gotten off to a much worse start. Los Xolos hosted Cruz Azul on Friday night, with much excitement over the new-look Tijuana side. What we saw was probably their worst performance for over a year, with an alarming number of errors from both teams. Almost as if the new season had come too soon. Cruz Azul were able to earn the victory, making the most of a horrific Gibrán Lajud error, before finishing the match off on the counter. Paco Jémez will be pleased with the three points, and the way his side finished the match off, but not with their alarming 57% pass efficiency, or two shots on target. Tijuana were more efficient in possession but struggled to create, resorting to hopeful long-balls not long into the match. A poor start, but important to remember this wasn’t Tijuana’s strongest Xl. The likes of Gustavo Bou, Enzo Kalinski, Paul Arriola and Joe Corona could all come in and improve the side. And improve they must. Lobos BUAP earnt a decent point in their opening match following promotion to Liga MX, against Santos Laguna. The Quinones brothers, both on loan from Tigres, were very influential in this match. Julián scored his side’s second, after Luis had pressured Jorge “Chatón” Enríquez into turning the ball into his own net. Both goals stemmed from crosses, which may give some indication as to how Lobos will look to create chances this season. For Santos, two-two was an all too familiar score line. Seven of their last 15 matches have now ended two-two. Osvaldo Martínez and Julio Furch got the Santos goals, with Osvaldito’s a classy chipped finish. Unfortunately, only fans in the stadium could enjoy what appeared to be an entertaining match. Lobos are yet to agree a deal with Televisa, and therefore their opening Liga MX game wasn’t televised. Frustratingly, there are also no stats available from this match either. Hopefully a deal can be agreed very soon. It’s a great shame to miss out on seeing the newly-promoted side, especially in 2017. Has the season started too soon? With the current schedule of Liga MX, there’s clearly very little, if any, wiggle room to change the start date of the season. But the early date unfortunately meant a diminished first week of Liga MX. 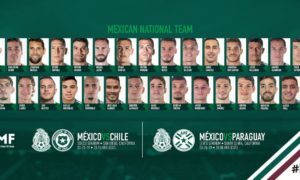 13 of the 18 teams were missing at least one player on international duty at the Gold Cup, and there are questions over whether the players that featured at the Confederations Cup have had enough time to recover. Come the end of the season, and the World Cup, those players may be suffering with fatigue. For the short-term, Chivas have been hit hardest, with five of their players currently in the Mexico Gold Cup squad. Plus, they will suffer the long-term absence of Alan Pulido, injured whilst playing at the tournament. Chivas were one of many sides patching up their starting line-up with young debutants this week. Furthermore, some of the players that were available to play didn’t look anywhere near full match sharpness. 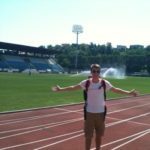 Take the Tijuana-Cruz Azul match as an example. Possibly the worst Liga MX match in living memory, just 439 passes were completed throughout Tijuana-Cruz Azul, less than half the number in the Tigres-Puebla game. The error-strewn match was won by Cruz Azul, despite their pass accuracy of 57% and their two shots on target. Sure, La Máquina did score both of these shots, but the first goal only went in as a result of Gibrán Lajud’s calamitous mistake. It was, of course, great to have Liga MX back. But with the international players missing, and some players not looking quite ready for the new season, the Liga MX product was of a lower quality than what fans are used to seeing. The complete Liga MX and Ascenso MX kit guide for the 2017-18 season.